THURROCK Harriers Long Jump star Funminiyi Olajide, age 16, continued her recent superb form retained her National U17 Long Jump title at the England Athletic Championships held at Bedford International Stadium on Saturday (25th). Her first jump of 6 metres could not be reached by any of her rivals and she won by a margin of 28cm. 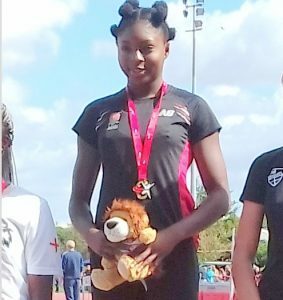 Funminiyi, along with Theo Adesina, will be helping Thurrock Harriers in their quest to win the Eastern Young Athletics League on September 2nd and are both looking forward to the Schools Games in two weeks time where they will represent England.